Webster's defines "keynote" as "a prevailing tone or central theme, typically one set or introduced at the start of a conference." But as you are well aware, we have already had two and a half wonderful days of our conference. "How," I was forced to ask myself, "will my voice key the notes emanating from the conference?" Perhaps, I thought, I should listen to your projects over these first two days and then hide myself away Friday night to prepare the definitive synopsis of your ideas—leading you where you wanted to go, as it were. Now, I assume that at least one of the reasons why Nathan and Annie Laurie issued their request to me to address you is that I am one of those—shall we say "elderly sages" or "old buffaloes"?—who were fortunate enough to have spent time with the stimulus to our study, Kenneth Burke. And my thought of spending Friday evening preparing my remarks reminded me of a Burkean moment. 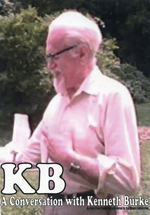 I was fortunate enough to host KB at a conference that Jim Ford and I put together in Lincoln, Nebraska, in 1984. It was a marvelous conference on the subject of Critical Pluralism bringing together many of the great thinkers of the twentieth century including Richard McKeon, Wayne Booth, Robert L. Scott, Bruce Ehrlich, Ihad Hassan, Ellen Rooney, Stanley Fish, and of course, Kenneth Burke. The soon to be eighty-seven-year-old Burke was scheduled to present on the third morning of the conference. With no little amount of concern, I arrived early at the hotel to retrieve my charge for breakfast. I rang his room . . . , and rang, and rang. No answer. Finally, a weak voice answered. "What time is it?" "It's 8:30 KB. You are on in an hour and a half." "Oh, my gosh, I was up all night nailing that Howdy Wit," he said. I knew immediately he meant Hayden White who had spoken the day before. And, then I realized that Burke had rewritten his presentation that would take place within hours as a response to White's presentation that had riled his feathers. "I think I will skip breakfast and sleep a bit more." "You can't do that KB," I pleaded. "You need to have something to eat." Finally, he agreed to meet me for a bowl of cereal and some juice before we walked to the conference. As the hour for his presentation arrived, he was certainly himself. The day before had ended with a presentation by Richard McKeon, who had ridden the ferry back and forth with Burke when they were studying together at Columbia University a century ago . . . in 1917 (Seltzer, 41). It was my distinct honor to host the last dinner that these two greatest humanists of the 20th century shared; McKeon would die within the year. For posterity it was at the Glass Onion in Lincoln, Nebraska. Anyway, I digress. That morning in March 1984, as Burke rose to speak, I realized that the appearance of these two displayed perfectly the contrasting habits of mind that made them so wise and so valuable to all of us working in their wake. McKeon, the day before, was as McKeon always was. He was immaculately coiffed, nattily and carefully attired in a three piece suit with a sparkling watch chain perfectly arced across his five button vest, visible through the perfect hang of his open suit coat. His wing tips were polished to a spit shine. He spoke in full sentences with each word seemingly measured. His presentation was easily outlined by those so inclined and each of his claims was presented clearly, explained precisely, and supported thoroughly. Now this morning, the group was to hear from his counterpart in the humanistic Valhalla, Kenneth Burke. Burke's hair was in disarray. He wore a shirt that hadn't seen an iron in some time, and a green sweater lay askew around his shoulders, unbuttoned, with it quite obvious that none of those buttons were about to meet their corresponding button hole. Pants sagged just a bit. His loafers showed the mud generated from the rain the day before. As he approached the podium a sheath of yellow legal size sheets in his hand bore the unmistakable scribbles of his night's work. And sure enough, we were to hear him glide quickly from topic to topic, sometimes uttering a sentence, sometimes a fragment, sometimes a mere word, fumbling with the order of his pages, arms flailing, every once in a while breaking into that impish smile and saying "You know what I mean?" And we did. Maybe not fully grasping every thought, but certainly we understood the insightful direction he was leading us. White sat somewhat uncomfortably, recognizing that he had been upstaged. I cannot remember the full impact of their dispute after 33 years, but I do remember the exchange that followed Burke's presentation. As I opened the floor to questions White's hand rose gingerly into the air. "It is my view that we think too little these days," White offered, "about death." Looking every year of his age, the nearly eighty-seven-year-old Burke did not pause. "Well, you may not think about it much, but I pretty much think about it all the time," he responded. The room broke into laughter and we were off to a rewarding intellectual parlor conversation. Well, Burke would be Burke, but I decided I should not follow his example and spend a sleep-deprived Friday night preparing my remarks. For one thing, I am not as quick and witty as KB at his best, especially when sleep-deprived. But more than that, I do in fact have a message to deliver after my many years of interacting personally, and through his writings and mine, with the person who keynotes our conference far beyond my humble abilities to add or detract. I want to make clear that I view my task today as something other than to tell you: "This is what the master actually meant." I will leave the exegesis to others. Nor am I here to declare precisely how we must now go beyond what Burke taught because the world has changed. Indeed, my pursuit is subject to neither a specific time nor a specific place. When I read Burke and similar scholarly models, I try to understand how they think through problems. "Habits of mind" is the term I used to refer to McKeon and Burke earlier: the characteristic way they array our understanding as they explain the world they experience. When we master such a habit of mind we advance our own capacity to richly encounter the experience that is life. We have not mastered an understanding, but acquired a way of seeing. My last metaphor here has been visual which recalls one of my favorite Burkean figures: the two launches in the photograph hanging in the Museum of Modern Art. In the introduction to A Grammar of Motives, Burke described an incredibly complicated photograph: an intricate tracery of lines. But if the viewer briefly closed her eyes, opened them and looked again at the photo, she saw simplicity rather than complexity: two boats proceed side by side generating the interlocking patterns of their wakes (xvi). So, what I want to do today is to talk about what I take as a habit of mind that continually plays out in Burke's thought and journey, the simplicity of which is obscured by our seeing only the complication of his writing. Now, I will also warn you that I do not propose something made simple from cultural familiarity. No, indeed. This habit of mind has been largely lost to our culture because of our intellectual traditions and the politics of the twentieth century. Part of the reason we must seek it anew is that against our cultural and intellectual normality the habit of mind marks Burke as an aberration, not as a simple essence. Time to locate that habit of mind. I believe the best approach will be by triangulating the pattern, first from the perspective of our conference theme: conflict. The conference website traces the term back to its Latin roots: "to strike together." Over the years—specifically since the 1600s if we believe the OED—the term has acquired its more social meanings of combat, quarrel, or competition. I want to take my cue from the program and return to that Latin root. Two things are required for that meaning, (1) difference and (2) a vector that hurls the aspects of that difference into each other: to strike together. I think there is a word that will serve us better to communicate the imperative: "tension." I believe that Burke saw the world as composed—transitive and intransitive—through tension. Moments are given shape by the striking together. Understanding follows grasping the tensions that animate moments. To continue the triangulation, consider a second approach: a little thought experiment. When we humans meet a moment and begin to engage it as an experience, what do we do? Many of us typically categorize: What just happened? What word best describes it? What other moment is this one like? We invoke these basic analytic tools: abstracting, naming, analogy. But I think Burke's habit of mind went at it with a slight difference. I think he experienced by seeking the tension that drew the moment into focus. What "striking together" compels us into the moment? Does it confront our expectations? Does its release of energy invite or threaten us? Are we called to become involved in resolution? What inherent conflict—what inherent energy—drew us into the moment? Burke envisions this moment most explicitly in the beginning paragraphs of Attitudes Toward History. His living human critic—remember all living things are critics (P & C, 5)—embraces the tension of her moment. She senses the tension—the friendly and unfriendly—and having now constructed experience, begins to work into it, through the offices of human symbolic acts (ATH, 3-4). The third perspective of our triangulation may finally put a recognizable name on this habit of mind for you: a focus on Burkean dialectic. Dialectical terms are everywhere in Burke's thinking and writing: permanence and change, identity and identification, actus and stasis, merger and division, the list goes on. These pairs emphasize how words do not define through their platonic ideal, but through their relationship with other terms. These dialectics mark tensions and they make the case for the centrality of tension. In terms of the meaning of words they reject referential theory—meaning is correspondence with a located reality—and point instead to meaning in use in context—a contextualist theory of meaning. And Burke was a major figure in the rise of contextualism in the twentieth century, perhaps its most thorough philosopher. When he considered the three orders of terms in A Rhetoric of Motives—positive, dialectical, and ultimate—it is in the dialectical order where humans live. Burke characterized this as "competing voices in a jangling relation with one another" (187). (As an aside we should note that even with the positive order of terms Burke invoked Kant to see them as "a manifold of sensations unified by a concept" (183). Thus, even a positive term is not in its essence a pointing, but a merger—a striking together.) Humans live in a web of connections where things strike together. Like the mental trick of blinking the eyes and seeing the intricate tracery turn into simplicity, encountering through abstracting, naming, and analogy disappears into a different habit of mind: dialectical tension. This latter way into dialectic, however, emphasizes the role of words—of language, of symbolic action. After all, Burke's most concise definition of dialectic, that in A Grammar of Motives, proclaims, "By DIALECTICS in the most general sense we mean the employment of the possibilities of linguistic transformation" (402). Elsewhere, I have argued that Burke's dialectic differs from Hegel's philosophical dialectic and Marx's historical dialectic because it is a linguistic dialectic ("Rapprochement," 157). The symbol-using and mis-using animal differs because of the symbolic capacity. With language we project ourselves into the action of the world in conjunction with others. Our epistemological, sociological, and behavioral encounters develop within the capacity for language. Well, dialectic can be complicated, particularly in Burke's hands. So, let me finally cut to a simplistic explanation: the simplest shorthand for understanding the habit of mind is the substitution of the "both/and" dialectic for the "either/or" binary. Either/or is the binary of mechanistic, referential habits of mind. The binary performs categorization and leads toward essences, platonic ideals, and what I call "hardening of the categories." Both/and turns the other way, emphasizing that division in the merger/division dialectic always draws back toward merger. Tension lies in their field of contestation—their striking together. So insistent am I that this is a key to Burke's thought that when my students parody me, they do so most often by simply mouthing in unison "both/and." But what their simplification leaves out is the complexity that opens up once our habit of mind turns to dialectical tension. For now, the contours of the striking together compel attention. What are the claims of the "and" in "both/and"? What narrative is set into action by the merger? And where does division defy the merger? I see this as Burke's native habit of mind. Experience tension. Find the energy generated by the striking together. Accommodate both/and. Tease difference into the drive toward merger that inheres in every distinction. When encountering the either/or, transform it into its comparable both/and. Humanity—the human genius—lies in negotiating tension through the power of symbolic action. Of course, human action is at the center of this habit of mind. So, I suspect you are thinking about the both/and of our conference theme: conflict and communities. Going to that more socially focused pairing may provide an even fuller appreciation of Burke's habit of mind. Burke certainly formulated a sociology, developed by his disciples including most notably Hugh Dalziel Duncan and Joseph Gusfield, built on the constructs of other important contextualists in sociology, notably George Herbert Mead. There is no doubt of the presence of social concepts in Burke's work. He exploited the figure of the Tower of Babel linking language and diversity, and lodging the charge to humans to overcome that diversity through language. He exploited the figure of the wrangle of the barnyard. He portrayed war as the epitome of both cooperation and division, illustrating the extremity of dialectical tension and the both/and. He gave a central role in A Rhetoric of Motives to the dialectic of identity and identification that stresses how life is lived within the tension between the biologically autonomous individual and the loquacious inventor of community. The flow of life framed in those first two pages of Attitudes Toward History was a portrayal of communities managing the tensions of history through rhetorical interaction. The key to understanding Burkean sociology is to grasp two things about his view. First, sociology is derived from the linguistic. Humans are the symbol using and misusing animal. Throughout daily life they transform the resources, the potentialities, of language to construct relations with their fellows, friendly and unfriendly. We are reminded that those two comm- words—community and communication—are intricately related to each other. One inheres in the other. The division in that conjunction "and" must be countermanded by the merger of "both/and." Conflict arises within the shared dialectical transformation of the linguistic into both rhetoric and social order. Perhaps this is a perfect moment to repeat the meaning of both/and, emphasizing the dialectic necessity of always forcing division into merger and vice versa. The second key to Burke's sociology is this: Life is lived in the experiencing, creating, and cathartic relieving of dialectical tension. The concept of narrative, for example, arises from the interlocking of language and social action. No understanding of human interaction works well without understanding the linguistic transformation performed therein. I have argued elsewhere that this is the error of many treatments of Burke and hierarchy: separating the social hierarchy from the linguistic—seeing them as sequential causality—when instead they should be considered as dialectical performance. What is inevitable in hierarchy is simply how language inherently invokes and orders distinctions, and that inherent capacity is a linguistic resource, there to be exploited or transformed into the merger that is social order ("Burkean Social Hierarchy," 210-18). Conflict and community are inextricably linked within the linguistic dialectic. Community naturally produces and is a product of conflict performed with the resources of human language. As conflict seems to divide, it requires and produces the cooperation from which the identity of communities emerges. This structural necessity illustrates again the power of both/and: conflict which seems to mark the divisions within a community is transformed as it performs the constructive process that reinforces the dance of community relations. I fear that I am guilty of multiplying a Burkean patois beyond easy assimilation, so let me move toward implications to illuminate what difference this Burkean habit of mind makes. Let me begin where my great teacher Bernie Brock always went: to contemporary politics. Obviously, those of us in the United States are now caught in a toxic political culture. Division is the order of the day, reason seems to have fled, and the line between words and violence seems quite thin. Conflict, indeed. Lamentation is heard daily, deploring the demise of civility, within a surrogate self-flagellation performed by our political intellectuals. But if the habit of mind projects tension as natural, particularly in the human barnyard of politics, then the contemporary moment is reimagined. The best way to grasp this is to recall Burke negotiating the 1930s. As my co-keynoter Ann George and Jack Selzer have well documented, Burke was deeply involved in the intense political conflict of the 1930s. The politics of that decade were shaped by the tension between stability and anomie, the dialectic of permanence and change. Within that dialectic, democratic politics manifests permanence in consensus and change in ideological turmoil. At that time, as today, turmoil was clearly ascendant, but the yearning for the re-emergence of consensus was palpable. These were times appropriate to seeing politics as a striking together. To complete the habit of mind, however, we must remember that Burke's dialectic invokes linguistic transformation. It is wise to ponder for a moment the perspective that gave rise to his two greatest political tracts: "The Rhetoric of Hitler's 'Battle'" and "Revolutionary Symbolism in America." They represent the both/and of another tension Burke lived, which I have characterized as "linguistic realism and social activism" ("Burkean Social Hierarchy," 218). The critic of "The Rhetoric of Hitler's 'Battle'" saw how political cultures constructed their motives from powerful symbolic resources with dramatic social consequences. He sought to divulge "what kind of 'medicine' this medicine-man has concocted" (PLF, 191). He worried out loud about the use of this medicine in America. In his deconstruction of the link between language and malignant political power lay the possibility of linguistic transformation of political motive. In contrast, the social activist of "Revolutionary Symbolism" later described the intensity with which he approached his speech to the First American Writer's Congress: "I really wanted to get in with those guys." His message that day aimed at persuasion: the American party needed to adopt a vocabulary that would motivate Americans to their banner. These two essays with their different approaches enact the merger of more tensions: the dialectic between identification with a political community and assertion of an individual political identity, paired with a tension between language's power to coordinate action through motive and the rhetor's power of persuasion to move others. Burke lived in a world which sought to bring these various tensions together in the service of linguistic transformation. Would Burke deplore the state of our democracy? Sure, . . . in his comic way. For ironically, in the chest-pounding lament for our lost democracy today there is a surprising void of linguistic transformation. Today's public intellectuals seem to not only lack a Rexford Tugwell and William F. Buckley, they also lack an H. L. Mencken or Will Rogers. Where are the voices celebrating and invoking transcendent values to foster identification? Where are the narratives to envision a democratic resolution? The habit of mind that saw first the natural tension that defines democratic politics would seek to tease resolution, even within energetic critique. Babel, however, was not just about politics. Genesis tells us that the Lord said, "Let us go down, and there confound their language, that they may not understand one another's speech. So the Lord scattered them abroad from thence upon the face of all the earth" (King James Version, Genesis 11:7-8). Thus, the Judeo-Christian Bible linked language, understanding, and the diversity of communities. In the dialectic of his confounding, the Lord fashioned the challenge for humans to overcome their diversity. Today, in the conjunction of globalization and racism, that challenge is foremost. How would a habit of mind that began by seeing a striking together encounter the challenge? In our world, the tensions of globalization versus tribalism (and its variant nationalism) manifest in the social conflicts that are terrorism and racism. Within their intense rancor, it is so hard to see the need for linguistic transformation. But perhaps nowhere is the need for linguistic transformation more vivid. Underlying the current talk about these divisions is an understanding that language plays a role. The war on terror invokes the Manichean judgment of "evil" and prescribes "war," "killing the infidel," and "annihilation." Pejoratives such as "radicalized" and "hate speech" describe the language of the other in this Babel. Less prominently condemned is the dominant culture's voice: the symbolic aggression of cultural hegemony. Yet, to this point, the strategies that would transform the issues of cultural clash and once again invoke that powerful symbol of Christmas 1968—the image of the big blue marble rising above the moon—are wanting. Seeing the problem in these terms challenges this habit of mind to pull humans back toward identification and community. It seems to this point I have sought the significance of this habit of mind exclusively on the conflict side of our conference theme. Hopefully the both/and that drives the two words of our theme together has not been lost as I have emphasized political and social conflict. So, let me ponder where we go if we emphasize the comm- side of the theme. And let me focus on that comm- interest in which most of us are occupied in some way or another: communication. In our age, that focus teases out concern about the new technologies of communication. Late in life Burke saw and wrote about the dangers of technology, but I think he could not have foreseen the internet and the other new technologies of communication. If we begin with his habit of mind, however, and look through the eyes of dialectic, certain observations follow. At a rudimentary level, a habit of mind that begins in an inquiry of how tension draws moments into context compels students of language to engage the emerging concern with the economy of attention (Lanham). The difference is profound when tension is not the product but is the initiate of communication. A Burkean view on the economy of attention is ripe for work. But at a more focused level, understanding the impact of the new communication technologies may be opened by their power to illustrate the dialectic of merger and division. The promise of the universality of the internet is to electronically remove divisive barriers that limit communication, to permit identification across geography and, with electronic translation, even across languages. Now, it seems, the people of earth have a new tool to overcome the Lord's decree at Babel. But alas, just as dialectic would promise, in the trajectory of the new technologies of communication the prospect of merger has confronted the reality of division. It turned out that easy access opened the power of the receiver over the author—Who shall I choose to hear?—and the openness multiplied rather than merged divisive voices. The dialectic tension created by the multiplied voices has been matched by a tension in the strategy of voice: the tension between identification—"We are one! "—and identity—"Because we are better than them!" So the new technologies have accelerated social conflict rather than resolved it. We can observe in the chatter within the new technologies, just as Burke observed about war, identification and identity enhancing both merger and division. I do not foresee the linguistic transformation that will hasten the full potential of the new technology. We do remember that humans are "separated from their natural condition by instruments of their own making" (LSA, 16). But perhaps there are lessons in the two previous technological crises through which Burke navigated. In one—nuclear energy—we seem to have achieved a passing grade on our linguistic transformation of its potential to destroy us. At least until the potential is reignited by another linguistic transformation. The other technological crisis—the environment and global warming—is unfinished. Even Stephen Hawking is now joining the Helhaven essay's projection for the human race, albeit giving humans a bit longer to escape to another world (Holley). But linguistic transformations critique the struggle in motives that may yet save the planet. We shall see. I finally want to consider the comm- side of our theme in concerns perhaps more familiar to many in this room: in the human capacity for creative strategic communication. How can those of us who study language and communication exploit the habit of mind that experiences human action within a striking together? Where is the potential in such habit of mind? Without fully documenting, let me charge that our tendency throughout the twentieth century was too often to view discourse and meaning referentially, and to generalize about its effects and the author's goals and achievements. We were failed stewards of dialectic. For many years of that century I taught and supervised others teaching argumentation. One of the hardest lessons for students in that classroom to learn was the concept of stasis—the point at issue in an argument; what the arguer was striking together. The notion that messages were expressions of an author's inner thoughts as a starting place for understanding was simply too strongly ingrained in the twentieth century mind. So, if we do begin to see a message as capturing a tension—discourse contextualizing a moment into a striking together—several important things follow. We will see a text as both individual text and as context. We will see each of the terms of this dialectic pulling on the other: context arising from text and forcing limits on text. We will overcome the isolation of authorship as expression of identity and put the author's voice into relationship with engagement, toward identification. In the process, we must look always, through the strategies of messaging, into the motivational quality of language in a symbolic driven world. The result is to see more clearly the dynamic nature of the world and the role that the human capacity for symbolicity plays in that dynamism. We will become—with all living things—critics. I warned at the beginning that I would refuse two burdens in my keynote. First, I would refuse to "interpret the master's words." I renounced exegesis. By pursuing the habit of mind instead—moving beyond the words with the metaphor of two launches as guide—my challenge to you today is to approach your work from a more fundamentally altered orientation. Second, I promised to avoid the argument that in this new world Burke needed to be reinterpreted. Indeed, there is nothing time-bound in my message. The habit of mind I have emphasized is an alternative that opens up paths of response in any moment, past, present or future. My challenge is to try it on as Burke did. Use this habit of mind and see how it opens up the world differently. There are reasons why dialectical thinking has been so difficult in the twentieth century. But I do not have time to fully explore the historical barriers today. I would hasten to add, however, that I believe the case to pursue this habit of mind emerges strongly from its silencing in the past. And my thesis is that in seeing Burke's contribution to this well-established intellectual habit of mind we will advance our own understanding. In characterizing his take on dialectic, I referred to Burke as perhaps the greatest philosopher of contextualism in the twentieth century. Let me end by returning there. As many disciplines developed through the twentieth century, contextualism as a mode of inquiry challenged the mechanistic view of the world. The terms here are Stephen Pepper's. Others have used different terms: humanism challenging science, interpretation challenging measurement, the subjective challenging the objective, and others. What contextualism championed was the role that the symbolic played in humans experiencing and participating in their world. The human assertion of text reached into the environment to construct context into meaning and ultimately into action. Burke's habit of mind developed through the century as he interacted with others to refine this way of thinking about humanity and its relationship to the material world. He elaborated the implications of the contextualist viewpoint: text gathered context and in its strategic core—what Burke referred to as the "great central moltenness" (GM, xix)—transformed meaning and coordinated action, by resolving the tensions emerging in interpretation. Words do not reflect change. Words do work; words perform change. Words—symbols—achieve linguistic transformation. There is much potential in this spirit as we go forward. Those of us working to understand and guide humanity have not exhausted the potentialities of this habit of mind, of the Burkean dialectic. Much is promised by encountering the world with the different questions generated by this habit of mind: What tension drew us into the moment? What "striking together" compels us into this moment? Does the tension confront our expectations? Does its release of energy invite or threaten us? Are we called to become involved in its resolution? What inherent conflict—what inherent energy—drew us into the moment? And what resources that we can call upon as a symbol user and mis-user will guide us toward transforming our moment to join with our fellow symbolic using and misusing animals in inventing our tomorrows? The text of this essay was first presented as a keynote address at the 2017 Conference of the Kenneth Burke Society on June 10, 2017. Burke, Kenneth. Attitudes Toward History. 1937; Berkeley: U of California Press, 1984. Print. —. A Grammar of Motives. 1945; Berkeley: U of California P, 1969. Print. —. Language as Symbolic Action: Essays in Life, Literature, and Method. Berkeley: U of California P, 1966. Print. —. Permanence and Change, 3rd ed. 1935; Berkeley: U of California P, 1983. Print. —. Philosophy of Literary Form: Studies in Symbolic Action, Baton Rouge: Louisiana State UP, 1941. Print. —. "Revolutionary Symbolism in America" (speech, American Writer's Congress, New York, 26 April 1935). The Legacy of Kenneth Burke. Ed. Herbert W. Simons and Trevor Melia. Madison: U of Wisconsin P, 1989, pp. 267-73. Print. —. A Rhetoric of Motives. 1950; Berkeley: U of California P, 1969. Print. —. "Towards Helhaven: Three Stages of a Vision" Sewanee Review 79.1 (Winter 1971): 11-25. Print. George, Ann, and Jack Seltzer. Kenneth Burke in the 1930s. Columbia: U of South Carolina Press, 2007. Print. Holley, Peter. "Stephen Hawking Just Moved up Humanity's Deadline for Escaping Earth," Washington Post, 5 May 2017. Blog. https://search.proquest.com/docview/1895497983. Klumpp, James F. "A Rapprochement Between Dramatism and Argumentation," Argumentation and Advocacy 29.4 (Spring 1993): 148-63. Print. —. "Burkean Social Hierarchy and the Ironic Investment of Martin Luther King." Kenneth Burke and the 21st Century. Ed. Bernard L. Brock. Albany: SUNY P, 1999, pp. 207-42. Print. Lanham, Richard. The Economics of Attention: Style and Substance in the Age of Information. Chicago: U of Chicago P, 2006. Print. Pepper, Stephen. World Hypotheses: A Study in Evidence. Berkeley: U of California P, 1942. Print. Selzer, Jack. Kenneth Burke in Greenwich Village: Conversing with the Moderns, 1915-1931. Madison: U of Wisconsin P, 1996. Print.